While I can’t say I was as enthralled with Mad Max: Fury Road as most people, I did enjoy finding out what all the excitement was about. I found myself in awe over some of the stunts and impressed with much of the acting. When Mad Max: Fury Road came out in theaters this past summer, it got rave reviews from critics and audiences. It also became a social commentary for a pro women agenda. It led to numerous discussions, which I'm sure almost any major film wants. I'm just not sure it deserved some of the hype it received. As it makes its way to retail stores for the Blu-ray/DVD release this September, I watched it for the first time, and while I enjoyed it well enough, I just didn't get what the excitement was all about. 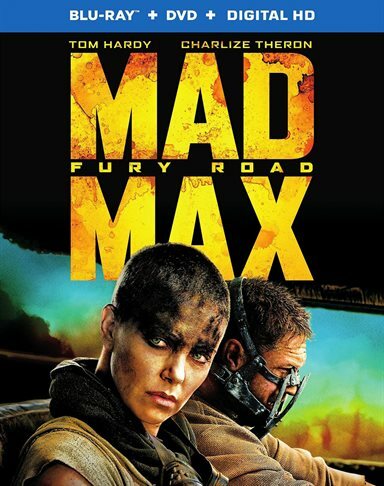 This version of Mad Max follows Imperator Furiousa (Charlize Theron; Prometheus) defying her "Master" Immortan Joe (Hugh Keays-Byrne; Mad Max) by running away with his breeders to escape his tyranny. When Immortan Joe and his warriors chase her, she picks up an unintended passenger in the form of Max Rockatansky (Tom Hardy; The Dark Knight Rises), a "blood bag" who is half insane after the loss of his wife and child. Director George Miller (Happy Feet) does a great job setting the scene of desperation and desolation though out the land. The desert visuals are both stunning and barren and enhance the sense of the arid wasteland these survivors live in. The vehicles, characters and portrayals of the diseased are over the top, which seem to work in this case. Theron is nothing but the hard, solid female necessary for this role with only touches of softness when protecting the breeders or meeting her tribe again after 20 some odd years. In general, I find her to be excellent in almost every film and this is no exception. Hardy does a great job as the quiet loner Max. His portrayal of Max's moments of madness is unique and believable. Notable standouts include Nicholas Hoult (X-Men: Days of Future Past) as Immortan Joe's follower, Nux, and Zoe Kravitz (Divergent) as one of Joe's breeders trying to escape. The biggest letdown is the story itself. It is obvious from the beginning that the minimal storyline is just a tool to be utilized between the chases and fight scenes. For anyone who enjoys a little more substance in his or her films, this one is truly lacking. For those who really want to see lots of action sequences, this movie is pure gold. However, the missing dialogue requires the actors to get the emotions across in non-verbal ways; Theron and Hardy both do so beautifully, which, for me, was one of the saving graces of the film and made me not dislike it nearly as much as I could have. The gems in this Blu-ray collection though are the extras. From a look at the cast, to the amazing cars and the incredible stunts, the featurettes are very informative and interesting. The fact that they helped me understand the whole plot a little better and answer so many questions I had after the movie ended, was an added bonus. The 1080p video is kind of lost on this film, as I suspect the Director George Miller purposely made everything look grainy to heighten the believability of a barren post- apocalyptic world. However, the images on the extras are sharp with a plethora of hues that make the desert beautiful and so much more appealing. The Audio is also a little lost because, like myself, most people don't yet possess the necessary equipment to make the Dobly Atmos sound truly come alive. It will be nice in the future to be able to appreciate the explosions the way they were intended to be heard.